Director of Wind Band Conducting, Bundes-Academy and Past-President of WASBE (Germany) He studied piano , music theory and orchestral conducting at the conservatory in Lucerne . Further studies he did in the United States of America . In 1983 he lectured as a visiting professor for one semester of the University of Michigan in Flint , United States. Since then he has regularly guest lecturer and conductor at several universities in the United States. Concert tours have taken him as a guest conductor alongside the United States in various countries of Europe , Asia , Australia , Africa and South America . In 1985 he was at the conservatory in Basel as a teacher for wind band-management professions. From 1998 he headed for the wind band-management courses at the Federal Academy of Trossingen , Germany and from 2000 he also teaches an Bandistico the Istituto Superiore Europeo (ISEB) in Trento , Italy . He is also founder and conductor until 1993 the Schweizer Jugend Blasorchester. Since 1991 he has been artistic director and conductor of the Youth Sinfonische Blasorchester Baden-Wurttemberg , Germany . Furthermore, he conducts the orchestra of the Stadtmusik Zug , Switzerland and the Zurich Blasorchester. 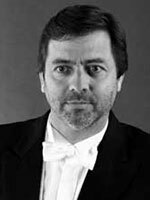 He is a board member of the World Association for Symphonic Bands and Ensembles from 1997 to 2001 and was President of this world organization. From 1993 to 2000 he was also artistic director of the International Festival for contemporary music in Uster , Switzerland. Also, he belongs to the board of the IGEB (Internationale Gesellschaft zur Förderung Investigation und der Blasmusik, Graz , Austria ) and was second president several years. He is author of several books and literature for conducting and brass orchestras.